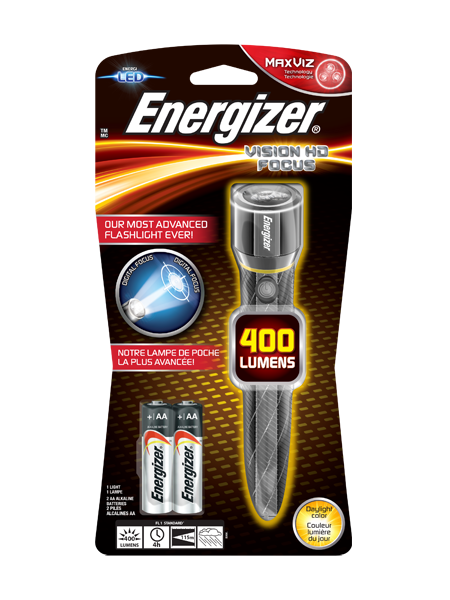 The Energizer® Vision HD is a versatile, high-performance light that provides exceptionally sharp, high-definition illumination. Using unique MAXVIZ technology, Energizer® Vision HD lights offer outstanding beam colour and optimized contrast, giving users an expanded field of high-definition vision. Smooth digital switching allows users to easily select between three beam options: high, power-saver and emergency strobe modes. The Energizer® Vision HD line provides enhanced light output and exceptional user control, making it ideal for the home, vehicle or workplace.